ca. 580 - 570 B.C. Detail of three Nymphs and Themis from a painting depicting the procession of gods attending the wedding of Peleus and Thetis. Themis is accompanied by six of her nine daughters in the procession of the gods--the three Nymphs (this image) followed by the three Horae (see image K17.2). 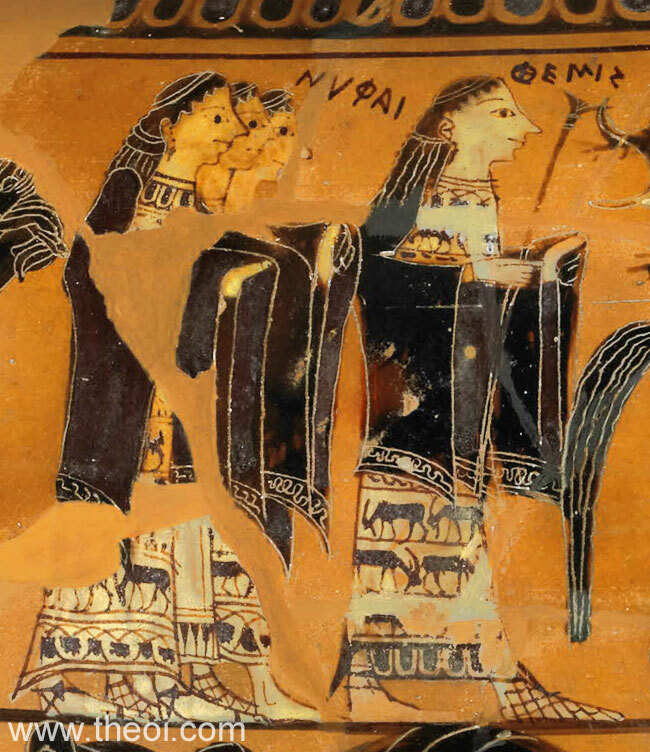 Her third set of daughters, the Moirae, appear farther down the line (see image K16.1). Themis bears a sceptre but she and her daughters are otherwise indistinguishable from the rest of the goddesses depicted in the scene. The poet Quintus Smyrnaeus describes the Horae serving ambrosial food and the Nymphs drink at the wedding feast: "Singing of Peleus' Bridal of Delight, which all the blest Immortals brought to pass by Pelion's crests; sang of the ambrosial feast when the swift Horae brought in immortal hands meats not of earth, and heaped in golden maunds; sang how the silver tables were set forth in haste by Themis blithely laughing ... sang how the Nymphs in golden chalices mingled ambrosia." The Nymphs of Themis are better known as keepers of the treasures of the gods in the Perseus myth. Peleus also received gifts from the gods, so they may serve the same function here.